The Tankerhoosen Valley is blessed to be home to a portion of the Hop River Rails-To-Trails Linear Park, the Shenipsit section of the Forest & Park Association's Blue Blazed trail system, the Belding Wildlife Preserve, several Northern CT Land Trust properties and as a result, miles of trails to explore. This section of the website will lead to a list of the trails with a description of each walk or area. The Vernon Parks & Recreation Department distributes an excellent map of Vernon's trail system with description and area maps. There is an online pdf of the document you can access. » Go to Vernon Trails map. 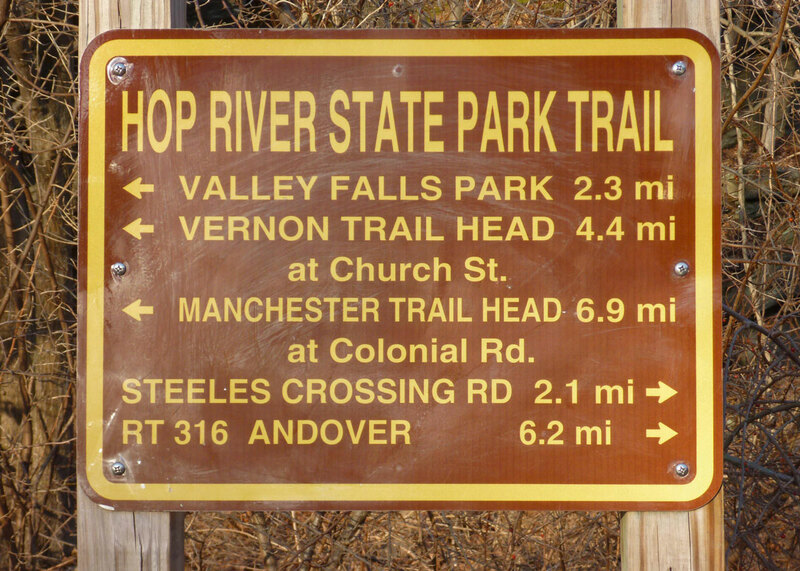 The Rail Trail through Vernon and Bolton is part of the Hop River State Park Trail from Manchester to Willimantic. It is one of Connecticut's top rail-trails. Narrow cuts and a lush tree canopy make for enjoyable visits year-round. Like a pathway through time, this serpentine path passes among modern subdivisions and crosses roads, but mostly takes the trail user along a remote, quiet and long unused path through the eastern Connecticut countryside. The Hop River is not in the Tankerhoosen Valley but flows from Bolton Notch along Route 6 to Willimantic. In the Tankerhoosen Valley the trail follows the north flowing Railroad Brook to Valley Falls and then the west flowing Tankerhoosen River to Manchester. The Vernon Trails map is a good guide but there are others. See map of full trail. The CT Department of Energy & Environmental Protection also has information on the web. See Hop River State Park Trail. The Shenipsit Trail is a north-south trail passing through the Tankerhoosen Valley. From south to north it begins in the Bolton Notch area, roughly follows the Rail-Trail to Valley Falls where it continues north through the Belding Wildlife Management Area continuing through the Tankerhoosen Wildlife Management Area to Walker Reservoir. From there you have to jump the highway and can pick up the trail again at the Tolland County Agricultural Center and follow it out of the valley along Shenipsit Lake. The path is described in detail in the Connecticut Forest & Park Association's Walk Book East. It is also described on the Vernon Trail Map linked above. The following links take you to an irreverent hikers description of the trail through the valley. » Go to Southern section. » Go to Northern section. This moderate two mile hike begins at the Church Street Rails-To-Trails parking lot, follows the old rail bed to Talcottville, and returns along the Talcott Ravine trail. For a combination of geography, geology, history, historic preservation and biology this is probably the best walk in the Tankerhoosen Valley. » Go to Talcott Ravine Loop. An Autumn Ravine Loop Hike was held in 2013 and is planned again for 2014. The hike includes speakers on history, geology and nature. » Learn more about the Talcott Ravine Hike. The Park & Rec Department's maps include guides to Valley Falls Park. The linked blog and website is Connecticut Museum Quest, one man's record of visits to many museum sites and trails in Connecticut. Part of his quest is hiking all of Connecticut's Blue Blazed trails. This page is Stephen Wood's detailed visit and comments on Valley Falls Park, part for the Belding Wildlife Management Area and NCLT's Webster Property which overlooks Valley Falls. The article provides a good account of what you'll find on your own visit and includes many photos. » Go to Valley Falls Park Trails & Belding Path.